Gerard Dijkstra met with success early in his career, when Flyer won the 1977 Whitbred trophy. 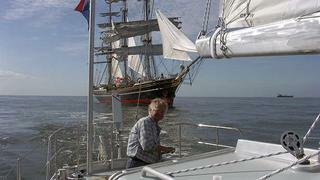 Gerard Dijkstra piloting his retirement yacht Bestevaer 2, with Stad Amsterdam  the clipper he designed  in the background. 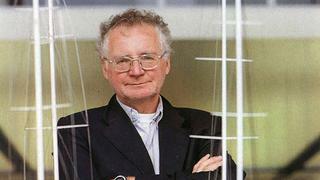 The sailing world might be forgiven for thinking that Gerard Dijkstra, as the most prolific purveyor of J Class, has a first name beginning with J rather than G. But J Class boats are only part of the story of Dykstra Naval Architects (the changed spelling reflects the office’s international status). Retired three years ago, the word ‘retirement’ seems purely academic for a man whose experience is regularly tapped by his colleagues at Dykstra Naval Architects and is still much in demand as a navigator for ocean races. ‘The calls on my time from the office are still high,’ he says. Delve a little into his past and you realise that there is a great deal more to this tall, professorial-looking designer than J Class boats. Born to an Amsterdam family with no history of sailing – his father was in the clothing business – by the age of 10 Dijkstra was devouring sailing books, especially those about the great age of the clipper ships. At 14 he had his own boat, a 14 foot BM, which he restored and in which he learnt the rudiments of wind and water. At 18 he was studying aeronautics at Delft University, until a head injury in his second year during a rugby match put paid to an academic career. A year later he was a deckhand on a Southern Ocean Shipyard-built Gallant 53, and in 12 months he went from deckie to skipper of a second Gallant and was chartering in the Caribbean. It was in an SOS-built Ocean 71, the unlucky Second Life, that Dijkstra began his solo career, dismasting off the Grand Banks at the end of the 1972 OSTAR. For a decade or so he was the complete professional racing sailor, proficient in both single-handed and fully crewed racing, and headhunted by Conny van Rietschoten for his triumphant Sparkman & Stephens-designed Flyer in the 1977 Whitbread. ‘As navigator and watchkeeper I didn’t get much sleep,’ he recalls. 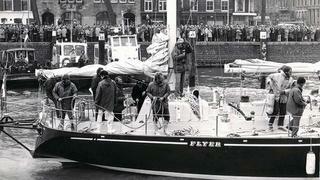 In 1976 he entered his second OSTAR in a yacht of his own design, the first Bestevaer, the nickname (it means ‘good father’) given to the famous Dutch admiral De Reuter by his crew. This time he only nearly lost his mast, limping back to Plymouth but still finishing within the time limit. Thereafter Bestevaer and Dijkstra featured in the entry lists of nearly every single-handed race in the calendar, but he still found time to study naval architecture under his mentor, Professor Geritsma, at his old university. The rest can be culled from the register of yachts: Stad Amsterdam, which combines the best features of 19th-century clippers with modern design and technology, the schooners Adix, Adela, Windrose, Borkumriff IV, Athena and Meteor, all designed by Dykstra Naval Architects, and the triple-masted Dynarig yacht Maltese Falcon. With another schooner, M Vorontsov, and two more on the drawing board, you could say the staff have their hands full. His heroes are the great designers Herreshoff and Watson. And of today’s men? Nigel Irens ranks high. ‘His 65-foot wooden schooner is a nice boat.’ And of the future? He sees commercial sail as a viable option. In retirement he says he would like to draw and paint and build models – but has no time. At just 63, Mr J may be busier than ever but appears to be in the enviable position of having plenty of time to fulfil a few more ambitions. ‘I would really like to design a merchant vessel, with sails. Maybe a Flettner rotor, or kite. Whatever,’ he says.